Side two of the album began with another of what I found to be the critical core tracks of the album. “The Misunderstanding” dated from McCluskey and Humphrey’s time in the band The Id, but unlike most of their debut OMD album, they decided to revisit this song on their second album. Good thing, too. OMD would not have been capable of giving this song the treatment that it needed at that time and it was better served by giving them some time to think on it. Here, the song was radically overhauled from The Id version. Gone was the jaunty, almost rockabilly pacing and jangling guitar. The tempo was slowed and the atmosphere was completely re-imagined as a dark, gothic mood piece. It began with low-level sepulchral choral patches that were a harbinger of things to come for OMD and would figure prominently on their next album. Then the sound of what seemed like the empty hulls of oil tankers scraping against the shallows intruded for a time. This was the sort of sound design that this band did that thrilled me. Who knows what they ultimately close miked to achieve this sound, but it was fully worth all of the effort. It all sounded just ponderously immense as the queasy lead synths entered, adding fluttering anxiety to the mix. Then the violent, gunshot rhythms entered the piece and threatened to derail it completely. A repeating keyboard hook courtesy of the Selmer Pianotron played for a few measures before McCluskey began singing the dark lyrics. The song sped up in tempo to almost match the original on the wordless chorus only to slow down again for each verse. Where the original had a cold ending, the new version had a long instrumental coda where the song eventually broke down leaving the slamming drums pounding out their rhythm with the wailing lead synths until even the drums stopped. I’m not certain if the drums were acoustic with heavy treatment or an early drum machine, but they sound more like the former. It must have taken the engineer days achieve the effect if they were acoustic. The hits sound like gunshots. Common now, but a radical approach for its day. The next song was one of only three here that were not included on the US “Orchestral Manœuvres In The Dark” compilation. “The More I See You” was originally a technopop composition that the band had written and then McCluskey started singing the oldie “The More I See You” over the music bed and they decided that it fit; even though the lurching, slightly funky piece sounded nothing like any of the common versions of the Tin Pan Alley hit that originally dated from 1945 but was best known by the 1966 Chris Montez cover that was a big hit. McCluskey was once again trying on new vocal hats with a new baritone croon tried for the occasion, thought his backing vocals once again scaled up to his more usual higher registers. The synth bass syncopated with the drums much more than was the norm for this band but that would also carry through to the next song. “The Promise” was another new experiment for the band with Paul Humphreys singing his first lead vocal as the band thought that it was a good move to diversify and offer variety. “Promise” was another heavily syncopated tune with synth bass cutting a vibrant path through the song. Humphrey’s vocals were pretty thin at this point in his singing career, leaving producer Howlett the option of tripling his vocals on the song’s chorus. He had yet to establish a large difference between his approach and that of Andy McCluskey to the point where I almost don’t notice that there was a different singer on the tune. The album closed with the band’s magnum opus, as far as I’m concerned. “Stanlow” has been described by Andy McCluskey as a “love song to a refinery.” I’d call it something a little more fervent. I’d call it a hymn. Stanlow was central to the Liverpool environment where the band grew up and it figuratively put food in McCluskey’s mouth as both his father and sister worked there. It began with a field recording by McCluskey with the refinery humming and chugging with a slow steady heart beat rhythm before lowing synth chords and choral patches resolved to a sustained chord that set the stage for McCluskey’s arrival. He tenderly sang the heartbreaking words which personified the refinery in the feminine. The first three verses have only the sound of the refinery keeping the beat with the sustained choral synth patch with McCluskey’s voice singing over it. Mournful chords broke the bleak rhythm like the first light of dawn as the refinery sounds faded. The stillness of it all was transfixing though the clarity of the mix was kept as simple as possible. The first human rhythm only appeared halfway through the song with a Korg synth pulse similar to that in “Autobahn” that was later juxtaposed by a reedy, oboe-like synth line. Then the drums only began a beat at the long song’s halfway point. Drummer Malcolm Holmes echoed the refinery’s hiss-clunk beat, with scant, subtle rhythmic fills adding frissons of percussive complexity while not straying too far into jazz territory. McCluskey crooned the bittersweet lyrics with resigned air of stoicism until the middle eight where his voice broke with passion on the line “we wanted a heart…to say what we want to” and his multitracked backing vocals crossed over his sustained lead vocals for the only time on the song. Then, just a one more verse before the Korg pulse once again slowed to fade out to be rejoined by the metal mother heartbeat of the Stanlow refinery; with the same sustained chord held throughout the song until the final “hiss-clunk” of the filed recording brought the song to a conclusion. It was a moving and emotional song to be written about an oil refinery. No one else was making music like this to my knowledge at the time. “Stanlow” cemented OMD’s reputation and fixed it in my mind. No matter what else they did, this would remain the band that had committed “Stanlow” to tape. Nothing could erase this achievement. For this reason they would remain significant to me. “Organisation” evidenced a huge leap forward from the self-described “garage synth” debut album. 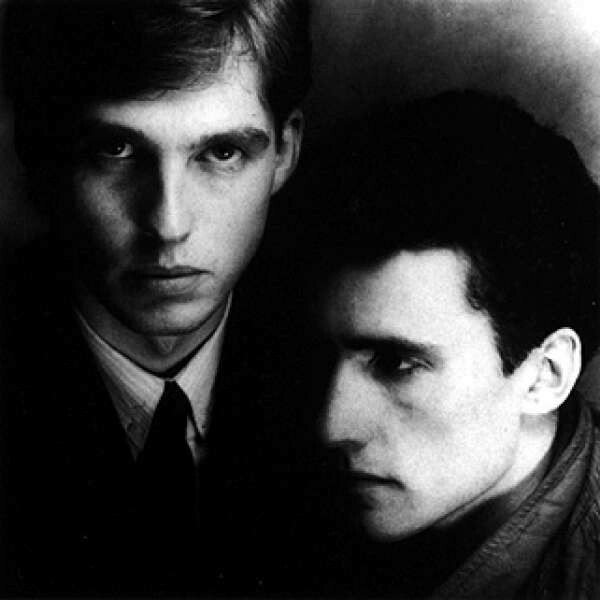 On this one, OMD unleashed their one trait that their peers could not match them on; their deep-seated penchant for melancholy that was at odds with the perceived image of the nascent synthpop scene. Their attention to sound design assured that they had pulled far ahead of artists such a Gary Numan, who had selected them to open for him on his “Pleasure Principle” tour. By bringing Malcolm Holmes in as their full-time drummer, they also avoided the traps that over reliance on drum machines had laid for a generation of synthpop bands. As ever, bands that mixed human and machine percussion rose above the pitfalls awaiting such groups. OMD were rewarded with an album that reached number 6 in the UK album chart and sold reliably well even as it was heralded by its only single, which hit the charts in the UK as well as major European markets and consolidated the open door to success that their previous single, “Messages,” had provided them with. Even in America [god bless america], “Enola Gay” had raised their profile and their appearance in the “Urgh! A Music War” film performing it live didn’t hurt any. We can be thankful that saner heads at Virgin recognized that no other track from the album should have been pulled into service as a single. This sort of simpatico by the record company couldn’t hurt any at all. As 1980 turned into 1981, OMD were poised to continue forward in the consolidation of their success, though by just how much would no doubt have shocked the band at this juncture. 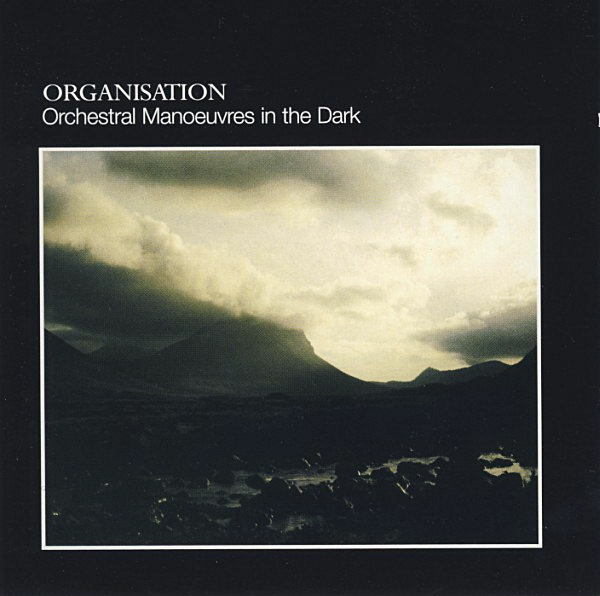 This entry was posted in Core Collection, Designed By Peter Saville, Rock GPA and tagged 1980, OMD, Organisation. Bookmark the permalink. Fascinating series. Keep up the good work. Can’t wait to see your take on Dazzle Ships. Thanks for these in depth series and the work that goes in to them. I too am intrigued to read what you have to say about Dazzle Ships,to me their finest half-hour. 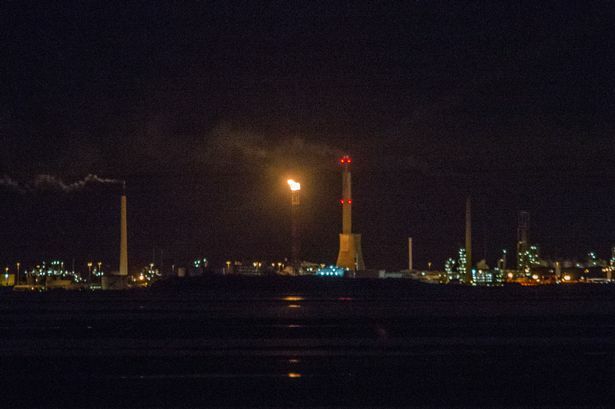 We used to drive past Stanlow at night,returning from family holidays in the 70s/80s and it glimmered and steamed in the night sky,very evocative. I’m looking forward to the continuation of this series. I recall the first time I cracked the cellophane on my cassettes back in the day and was amazed by the music on these first two long players. Having high-end Walkmans only added to the aural feast even though the medium degraded with some many repeated plays. I still prefer headphones to this day (along with my FLAC enabled Walkman). So many layers that add to the ‘songs’ that, fortunately, you can express on your blog. Very appreciate of the time and effort you put into your posts. KeithC – Though I was definitely an “OMD guy,” I was never a “Walkman guy.” To this day I dislike listening to music on headphones – though I do it when remastering from vinyl. I tried a portable cassette player and quickly realized that I didn’t respect the feeling of isolation or the amount of money I would have to spend on batteries ca. 1981! On a $7.50/week music budget it was a deal-breaker.